It is understandable that we sometimes overlook the surge of innovation and experimentation that has taken place within live musical performance over the last decade. A culture obsessed with emerging channels of distribution and incremental software upgrades is almost predisposed to overlook the virtuosity (or lack thereof) that drives live performance. A pertinent frame of reference in considering evolving paradigms in musical performance is the MUTEK festival, a progressive electronic music summit that takes place in Montreal each spring. Launched in 2000, and having just celebrated their tenth anniversary this past week, MUTEK has consistently programmed dynamic lineups of luminaries representing various facets of global house, techno and experimental music communities. The festival has cultivated an idiosyncratic identity that references the pulse and dense revelry of the after hours scene while also showcasing more amorphous, adventurous multimedia and gallery-oriented projects. In addition to positioning Montreal as a key node within international electronic music networks, MUTEK has developed into a platform for showcasing integrated audio-visual performance. Cologne minimalist Wolfgang Voigt presented his brooding Gas project as if it were a feature length film (directed by collaborator Petra Hollenbach). Voight's somber manipulations of Mahler and Wagner were accompanied by an eternal zoom into abstract imagery derived from an extensive, thematic photo archive. The resulting experience offered an uneasy descent into the depths of a charged, mythical Black Forest. Sheffield's SND complimented their textured rhythm permutations with an equally reductive graphic strategy. 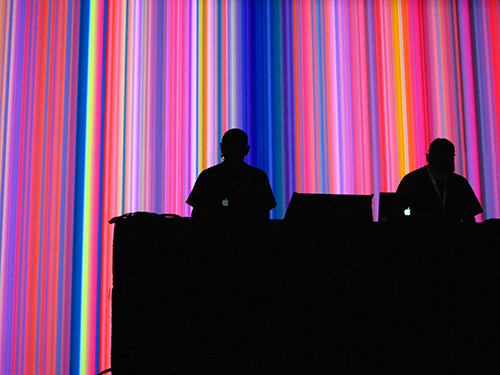 The duo positioned themselves in front of a large projection screen and each of their controller actions was registered as a vertical line that appeared on the right side of the image behind them. As time passed, audio events accumulated and the entire performance was documented as a polychromatic barcode, a side-scrolling digital tapestry [the development of this AV collaboration is extensively documented here by the designers at Derivative]. Tobias Freund and Max Loderbauer's NSI project was presented as a retro-tech performance that combined vintage analogue electronics with a dead simple lighting and refraction rig. The ambiance created by the duo and visual designer Jimmy Lakatos evoked comparisons to 1950s science fiction and Sun Ra flavored space jazz. Also, it was fantastic to see visuals that were completely immune to discussions about frame rate. These examples only really provides a taste test of the variety of programming within the A/VISIONS series. What is so exciting about these events is that they sidestep standard implementations of VJ culture, video art or "live cinema" and deliver an array of one-off experimental performances - sound, light, space and improvisation are reconsidered every time another act wheels their kit on stage. All of this said, there are two events at MUTEK 2009 that require special mention: the aforementioned raster-noton label showcase and Atom, a mechanical installation "played" by Robert Henke and Christopher Bauder. Raster-noton is an experimental record label launched by Olaf Bender, Carsten Nicolai and Frank Bretschneider in the mid 1990s. The Chemnitz-based imprint is known for stark, minimal rhythms that embrace some of the wilder possibilities offered by digital signal processing. This aesthetic extends beyond sound design and is complimented with equally spartan packaging that is invested in geometric patterns, negative space and precision. These design sensibilities have informed related installation work and more recently, realtime music visualization systems. 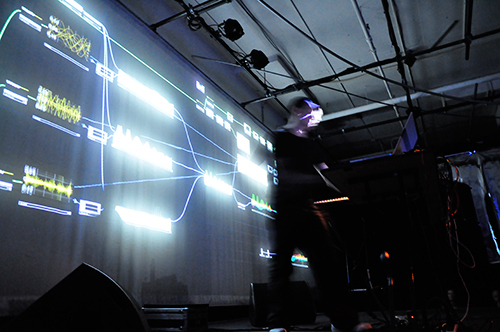 Earlier this year several raster-noton artists, including Bender, Nicolai and the aforementioned SND, began working with Greg Hermanovic and Markus Heckmann and the Derivative TouchDesigner Platform. This ongoing collaboration has resulted in a number of artist-specific visualization tools that use audio analysis to drive reflexive frameworks that integrate motion graphics with musical performance. This is done elsewhere, but seldom so convincingly. As for the label showcase at MUTEK, when confronted with the seeming transformation of an entire wall of the SAT into an elaborate interface during Nicolai's Alva Noto set, it becomes difficult to distinguish where media stops and architecture starts. Raster-noton referred to their rhythm_screen event at club transmediale 2009 as an "infinite dancehall" and this extreme thinking about the immersive possibilities of sound-image-space synthesis raises the bar for musicians, visualists and clubgoers alike. 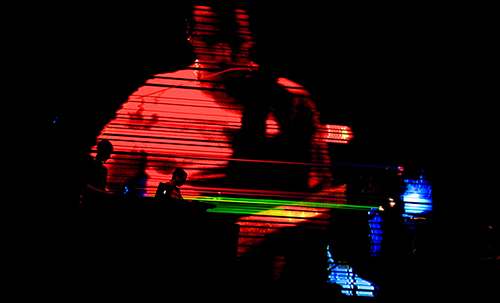 The highlight of MUTEK 2009 may well have been Robert Henke (aka Monolake) and Christopher Bauder's Atom installation. Far removed from a concert hall or a club, Atom was presented in a cavernous exhibit hall in the Place des arts. The piece involves an eight-by-eight grid of helium-filled balloons, each tethered to a motorized cable winch. Each balloon contains a dimmable LED and the entire assembly functions as a spatial instrument that responds to Henke's atmospheric ambient techno score. 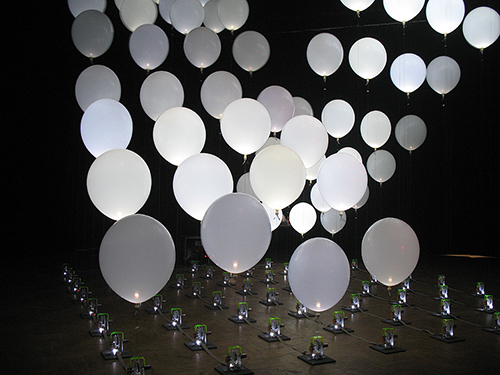 Audio events such as percussion hits trigger illumination within individual balloons and the height of individual nodes are constantly modulating. Bauder describes the piece as "a huge machine" that the two artists are collaboratively operating and Henke highlights the importance of limitations—a 64 LED matrix will inevitably deliver "musical, optical and spatial structures that have to be simple." Henke's musical performance is also guided by constraints and he limits himself to 4 MIDI clips as "that is the maximum that he can handle and really pay attention." Watching Atom being performed is a strange experience. You expect the piece might function like a crude 3D graphic equalizer, but it doesn't. You can see moments when both the musician and the interaction designer have the reigns and there is definitely communication between them and some moments of genuine play as well. The bass cuts out and the winch motors seem to harmonize with one of the MIDI clips. Henke and Bauder are not (explicitly) visible and the audience is left to collectively observe the constant state changes occurring within this kinetic playground. The piece is mesmerizing and in some ways it returns Henke back to the simple first principle on which techno is founded - the rhythm machine. It has been exciting to watch MUTEK gradually ramp up the amount and focus of their multimedia programming over the last several years. The distinct and provocative production design of the performances comprising the A/VISIONS event series and Atom obliterate most of the stock expectations associated with the intersection of live electronic music and media. Maybe the gestures of the performers aren't that important or interesting after all? Perhaps video and motion graphics don't need to be used like wallpaper? One minor grievance about the handling of the multimedia content: as stated earlier this week by Peter Kirn in his review of Gas, in some instances it is quite difficult to determine who the participating visual artists were - they were simply invisible in the program and on the MUTEK website. If a festival is going to go to the trouble of booking stellar media artists to interpret and augment musical performances they may as well bring them front and center. Certain visual crews such as Derivative and AntiVJ were featured quite prominently but in other cases it was difficult to figure out who exactly was pushing the pixels. Regardless, MUTEK is a music festival first and foremost, but the art, media and design undercurrents continue to get stronger every year. Greg J. Smith is a Toronto-based designer and researcher. Greg co-curates and edits the digital arts publication Vague Terrain and blogs at Serial Consign. Very insightful pseudo-review of the Mutek festival from an A/V standpoint. I wish I had been there to see the Atom installation! It seems in my mind though that a festival like this should push the man-machine boundaries more. I could see a lot of possibilities of brain/midi interfaces or other physiological monitoring devices used to drive visuals. It would be great to see visuals reacting to not only music but our reaction to music. Oops. CMS ate my response. To pick up that unfinished sentence: …what happens if that system is tweaked, perhaps it effects a filter or effect being applied back in the audio output. There is the possibility between graphical and sonic possibilities, kind of a collaborative workspace. Artificiel's POWEr kind of operated like this and I hope to write about this piece elsewhere soon. I think deploying these kind of systems and workflows within the context of a music festival is interesting because there is a built in tension and set of expectations that comes with the audience. I hope MUTEK continues down this path and other festivals embrace this grey zone between interactive/new media curation and musical programming.